What is ERW, DOM and Chrome-Moly? ERW stands for Electric Resistance Welded. This is a mild steel tubing that started out as a flat sheet of steel, formed into tubing and welded. DOM stands for Drawn Over Mandrel and it is actually ERW tubing that has gone through a second process that shapes and smoothes the tubing so that the walls are more uniform. This in turn makes the tubing stronger than the original tubing. Chrome-Moly is an alloy of steel which incorporates both Chromium and Molybdenum in the process. Please don't confuse Chrome-Moly with Chrome finish. All our roll bars are painted Black. What type of tubing should I use in the manufacture of my roll bar or cage? The answer to this question is usually found in your rule book. All street, street/sport and race roll bars are made with 1.75"x .120" DOM. Roll cages are made with either 1.50" x .120" or 1.75" x .120" DOM tubing (depending on the weight of the car). When can DOM tubing be an advantage over ERW? DOM is now required for a roll cage by most organizations. When should I choose Chrome-Moly? Autopower no longer offers Chrome-moly tubing. I've heard that Chrome-Moly is lighter than ERW or DOM. Is that true? No. Size for size, all steel weighs roughly the same. What is true is that Chrome-Moly is stronger than DOM and DOM is stronger than ERW. Therefore, some sanctioning bodies allow you to reduce the size of the tubing as you go up in strength. For instance, a sanctioning body may specify that you may use 1¾" x .120" ERW or 1½" x .120" DOM, Seamless or Alloy. The strength would be about the same between these two sizes/types of tubing but you may save about 10-15 pounds using the smaller size tubing. The tradeoff is cost. Here are a few examples of tubing sizes and weights per foot. Can I get my roll bar or cage painted another color? Autopower gives you two options: painted in black or no paint at all. If you would like your roll bar to be painted another color, powder coated, or chromed, we suggest that you order the bar without paint and then arrange to have the bar finished after you receive it. There is no charge for this special order request, however, Autopower does not guarantee that they will remember to not paint the bar or cage. What does "Truck Freight Collect" mean? Truck Freight Collect tells you the part is shipped by truck and freight charges will be collected upon delivery. We recommend that you ship to a business address as someone needs to be available to receive your part when the shipper arrives (usually between 9 AM and 5 PM). All shippers are a little different as to how they collect the monies owed. As we use several different shippers, and your product may be consigned to a third party shipper, we cannot tell you exactly what payment method is accepted. Most trucking companies will call before coming and you may then ask them the exact invoice amount and what payment methods they accept. Please don't ask if you can pay for the shipping in advance if you don't like hearing "NO". Cost of freight shipping depends upon where you live. For shipments of roll bars: within Southern California, we use Hollywood Delivery Service at a cost of about $45-$70. In Northern California we use Pilot Freight at a negotiated flat rate of $99. All other parts of the continental USA will be between $130.00 and $160.00 depending on where you ship to compared to the trucker's normal route. Autopower ships full cages on pallets and the shipping charge will depend upon the zone that you ship to. 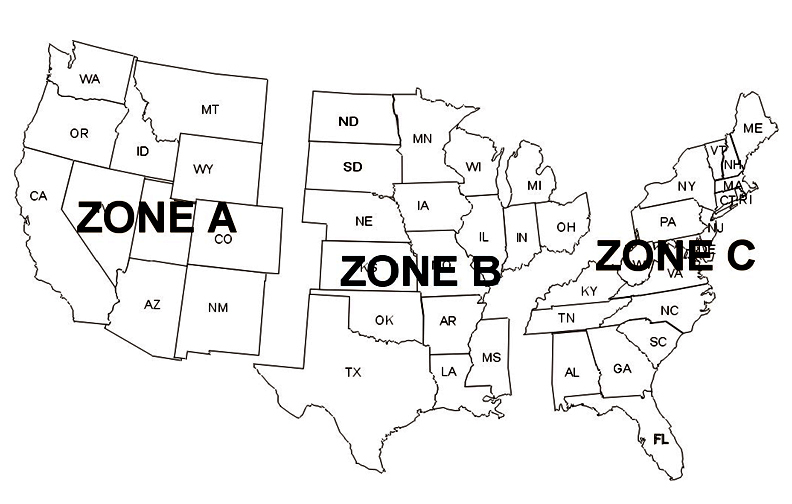 There are four zones: California, Zone A, Zone B and Zone C (see chart). California shipments will be between $128 and $163. Zone A will be between $150 and $185. Zone B will be between $170 and $205. Zone C will be between $185 and $220. If your delivery is attempted and no one is there to receive it or pay for it, you will be charged a storage and redelivery fee. Some of our smaller roll bars can ship by UPS. We can prepay the freight on these shipments and the cost is $69.95. If you live near San Diego, California, you may save shipping costs by picking up your Autopower items direct from the manufacturer. If you would like this option, choose "Pick Up at Autopower" on the shipping selection. If you live outside the continental USA, then please ask us for an estimate of shipping charges. I don't have a business address to ship to, what now? If you don't have a business address you can ship to, we can ship to a residence and the trucking company will call you before delivery, but you will still need to be there to receive and pay for the item. My roll bar came in scratched up. What can I do? I'll tell you right now, expect the roll bar or cage to arrive scratched. We try to protect the bar using plastic around the painted tubing, but as the bar rides in the truck, the vibrations will eventually wear out the plastic wrap. Most of the time these scratched areas will be hidden by roll bar padding. If you want a real nice paint job on your bar, please order it unpainted and have it painted upon arrival. Sometimes in Autopower's attempts to get the bar to you sooner, they wrap it in plastic before the paint is dry. Then when you take the plastic off, the paint peels off, too. Sorry, as I said, expect the paint to be messed up. The paint is there mainly to protect the tubing from rust while in transit. Are your roll bars and cages legal for racing? Most of our bolt-in roll bars and cages meet the SCCA, NASA and IMSA rules. Many road race sanctioning bodies follow the SCCA rules or they are not as strict. Please consult your rule book. Legality will depend not only on the design of the roll bar or cage, but also on the type of tubing used. Legality will also depend upon your class! Our weld-in cage kits are legal for most classes in NASA, SCCA, IMSA, Lucky Dog, ChumpCar, LeMons, Drag Racing and Circle Track, but again, check your rules. If you have any questions regarding your rulebook, you can call us at 1-925-254-7223 and we will be happy to consult with you. Are your roll bars or cages NHRA legal? The bolt-in roll bars and cages offered on our Web site are not NHRA legal. There are many reasons why these bolt-in roll bars and cages are not NHRA legal. A few are: size of tubing, telescopic rear braces, and size of foot pads. There may be more reasons. Many import drag racing organizations will accept the Autopower bolt-in roll bar or cage. Almost all organizations will allow you to have the roll bar or cage installed if your car class does not require you to have one. Please check your rule book. We now offer a weld-in cage by Autopower that is NHRA legal for certain classes. These kits have part numbers that start with "33" and can be found on our Web site. Check your rule book for your class to determine if one of these cages will work for you. Does the tubing in the U-weld Cage Kit come notched? No. The tubing is square-cut a few inches extra long to allow for a tighter, more custom fit. I ordered a U-weld Cage Kit. Where's my roll bar? Autopower U-weld Cage Kits are designed to add on to an existing Autopower roll bar. U-weld Cage Kits do not come with the roll bar. Please order the full weld-in cage kit with the part number starting in "33". I ordered a Weld-in Cage Kit. Why did it come unpainted? Because Autopower knows you have to weld the tubing, why waste time and money to paint the cage and then make you sand it all off. Why do you charge my credit card at the time of purchase instead of when the roll bar/cage is shipped? Roll bars and cages are special order items. Roll bars and cages may not be returned for any reason. Do the Autopower roll bars and cages fit well? Autopower designs each roll bar and cage to fit the model range of each individual car. For instance, Autopower manufactures a different roll cage for the 1984-1991 BMW E30 325, the 1992-2000 BMW E36 325 2-door and the 1992-2000 E36 325 4-door. These roll bars and cages were designed to have the full interior left installed. All roll bars/cages are designed to fit as tightly as possible leaving room for all car components to function normally and for production tolerances. If you have modified your car by removing things such as the headliner, the roll bar/cage will not fit as tightly in your car. Your model year may also come with factory changes that may make your cage appear to be not as close a fit as you would like. We guarantee the roll bar/cage to fit, not that it is aesthetically pleasing to your eye. The new Autopower weld-in cage kits (with part numbers starting with "33") come with the tubing cut a bit long. This allows you to fit the cage to the car tighter with less of a gap between the cage and the roof. A Complete List of Autopower Roll Bar and Cage Applications. OK, the roll cage has arrived but there is no way it is going to fit in my car. First, read the number stamped on the foot pad on the driver's side of the roll bar. Match this number up with the number associated with your car on our Web site. If the numbers don't match, call our toll-free number, 1-800-949-5712, and tell us the story. Everyone makes a mistake now and then, you may have received the wrong bar. If the numbers match, (sometimes one digit is left out of the stamped number compared to the number on the Web site) you are probably just not used to how tight these cages fit. Unwrap all the tubing and take some measurements to assure yourself. Try to fit it in the car, if this fails, call us, we will be glad to walk you through it. Do I need to have a professional install my roll bar or cage? Most of our customers install the bolt-in roll bars or cages by themselves. Because no welding is required (except for door bars), all you need are simple hand tools such as a drill and wrenches. Please see our sample installation page for an idea of what could be involved. There may be some tricky areas of concern such as wiring harnesses, fuel lines and brake lines that might have to be moved. Warning: check to be sure you know what you are drilling into or welding on before you start. You may find that there is a hidden wiring harness in a channel under the mounting plate. You might have to cut panels and carpet. You will have to remove and reinstall) seats and interior panels on most applications. U-weld cages, the Spec Miata cage and some roll bars require welding and/or notching with the required tools and expertise in these areas. If you have any questions at all, do not proceed. Ask an expert or call us on our tech line: 1-925-254-7223 or Autopower at 1-619-297-3300. If we don't know the answer, we will attempt to find out what you need to know. The cage has arrived but some of the parts are missing. Most of the time the parts are there, they are just hiding from you. Before taking delivery from the trucker, make sure that all pieces are there and that there is no obvious shipping damage. If there is shipping damage, refuse the shipment, or if minor, note the damage on the trucker's receipt. Scratched paint is to be expected and not a reason for refusal. If it looks like it has been run over by a fork lift or been dropped from a 20 story building, then that is a reason for refusal! If you suspect that there are pieces missing from your shipment, but there was no evidence that the piece fell off the package, accept the shipment and then unwrap the roll bar/cage. Usually you will find the pieces hidden by tape and the nuts 'n' bolts package. Assemble the cage outside the car to assure that you have all the parts and that you understand how the cage will be assembled inside the car. I am ready to install the cage but the instructions do not help me. Yep, Autopower's instructions are very basic. Maybe our sample installation will help you. How long should I expect for the bar/cage to be manufactured? 3-4 weeks for manufacture plus transit time of 1-7 days depending upon where you live. Autopower accepts rush orders for an extra $95.00. Autopower will then bump your order and produce it within 2 weeks and it will come without paint. Orders may also be expedited by shipping a faster/more expensive method.